Normally, I am absolutely useless at doing my own hair. Make-up isn't a problem but for some reason, I've never been able to fully get the hang of trying to blow dry my own hair - far too tricky to get to the back - I need another pair of hands and ideally eyes in the back of my head. Until now. 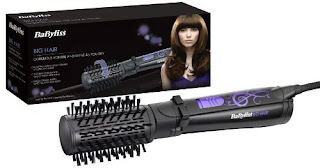 I saw the Babyliss Big Hair advertised just before Christmas and wanted to get one, but it was out of stock everywhere. But earlier this week, I went to the tiny Boots on the Walworth Road, and there one was. My expectations weren't that high - I've pretty much tried every gadget going and they don't usually live up to the advert. This, however, is bloody brilliant. Easy to use - even the first time, although it does get better with practice - and the results are excellent. I would highly recommend it. Buy it - you won't regret it.